Annoying Animal Sounds Christmas Novelties , "Muppet Christ Superstar," my vote for the strangest musical instrument ever, and "Cool Cowboy" are back up - by request, strangely enough. When legendary outsider oddball Tiny Tim was experiencing his late '60s fluke mainstream popularity, some low-level record company weasels dug up on old tape of Tiny singing classic old childrens and novelty songs and Tin Pan Alley standards, and for some reason decided to add some silly crowd sound effects. Tiny's voice certainly improved in the years following this recording. So Tiny never considered this part of his official discography, but there's still some good stuff here. Look at that song list - come on, don't you wanna hear a ukulele-strumming Tiny singing "On The Good Ship Lollipop" in his otherworldly falsetto ? 'Course you do! Former Roulette/End/Gee/Red Bird A&R George Goldner and possibly co-conspirator Morris Levy) takes credit for many of these old demos and rejects recorded at Red Bird/Blue Cat Records cira 1962-65. Only one single (1966's "April Showers" ever got a proper release on Blue Cat Records, with Goldner, a relative-in-law of Tiny's) in 1966. 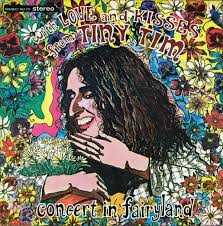 Tiny reportedly hated this album, referring to it as "unauthorized" in interviews, and it was released in late 1968 between the releases of "God Bless Tiny Tim" and "Tiny's 2nd Album". Warner/Reprise was confused by the issue, and reportedly sent out a lawsuit against Goldner and Bouquet Records, but not before this album sold (in Tiny's terms) at least 1,000 copies. Tiny claimed that this unauthorized release killed his career with Warner/Reprise. He would never again sell over a million copies as he did with "God Bless Tiny Tim", and up until his death in 2006 he stated this album was to blame. Goldner died in 1970 with this album's reputation considered something of a black mark on his otherwise legendary career. Thanks for the info! I'm a big Tiny Tim fan, but I don't think this "ruined his career," esp. if it only sold 1000 copies. More likely, the fickle public had had enough of him and moved on to the next media fad. Tiny himself only believed that the album was unauthorized, as he was probably trying to forget about early demos and home recordings made six years before the release of his second album on Warner/Reprise. George Goldner was a longtime partner of Morris Levy, and Levy, with a lot of help from the Genovese crime syndicate (The Mob, you may be well aware of)can take responsibility for many unauthorized albums. Even Levy's Roulette label was notorious for releasing many counterfeit records (case in point: John Lennon's "Sings The Greatest Rock And Roll Records-Roots" on the Roulette subsidary Adam VII Records in 1975, which led to a long-pending lawsuit between Goldner, Lennon, and Apple Records)upon the unsuspecting record buying public. Tiny never stated that he wanted the album released (with phony live audience and all. Tiny sharply stated in interviews that the songs were particularly recorded in the studio with no live participation) and only got annoyed when he realized that the album's sales were interfering with his contract with Warner/Reprise. Tiny should have known that this type of practice occurs all of the time in the music business with deals made with another record label before massive success happens,but nevertheless, the lawsuit claimed by Warner/Reprise, Mo Ostin (the head of Reprise), and producer Richard Perry torpedoed any more future releases by the then-newly formed Bouquet Records, and put the label out of business immediately after the said lawsuit. Goldner never recovered from the lawsuit after that, despite another attempt to form another record label in 1970 before his death. Morris Levy later found himself charged with tax evasion, money laundering, charged with counterfeit products, and his ties to the Mob bosses for his troubles, but escaped imprisonment by dying in 1989 before a proper trial could be written up. Roulette Records itself was sold to Rhino Records in 1985, and today the thousands of master tapes from Roulette (including possibly Tiny Tim's "unauthorized" Bouquet album) is owned by Dominion Entertainment and Eric Records, a specialty in re-issuing oldies recordings. A correction notice for the above comment: It was Morris Levy, not George Goldner that was involved with the 1975 lawsuit between Apple Records, John Lennon, and Adam VII Records unauthorized issue of John Lennon's "Roots" album. George Goldner had been deceased for five years by then, and had nothing to do with the lawsuit. My bad, sorry about that gaffe. Thanks again, it's a fascinating story. Morris Levy, I shouldn't be surprised - one of the biggest crumbs in the music biz. Over Sexteen Vol. 2: Prudes Won't Think It Funny!